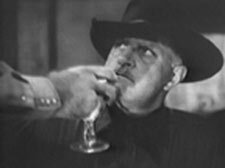 Like so many Gower Gulch badmen that worked in hundreds of B-westerns, there’s oddly very little personal information known about Frank Ellis. The primary thing is, among his peers, he was recognized off screen as a real nice guy. Not untypical of all the men who played heavies on screen. “A big blustering working heavy,” Pierce Lyden called him. Like dozens of others who found steady employment in western and serial productions, Ellis’ dour, sour-faced, droopy mustached puss became a familiar fixture to B-western watchers over a 34 year career that stretched from his (apparently) first role in “Elmo the Fearless” (Universal) serial in 1920 opposite Elmo Lincoln to his final showdown in “Silver Lode” (‘54) with John Payne. After “Silver Lode”, Ellis found steady employment as an extra in dozens of TV westerns through ‘62. Ellis worked in well over 450 films, including some 40 serials. He was nearly always one of the henchmen, but did manage to play the boss heavy in Jack Randall’s “Covered Wagon Trails” (‘40). Frank Birney Ellis was born February 26, 1897, in Oklahoma Territory (it became a state in 1907), near what is now Newkirk, not too far from the famous Miller Brothers 101 Ranch which was in full glory. He spent much of his youth hanging around the celebrated outfit, becoming acquainted with the show world. His earliest credited western is “King’s Creek Law” (‘23) with Leo Maloney.For the next 30 years the prolific Ellis seldom strayed away from western badman or bully roles (except in Sam Katzman serials). 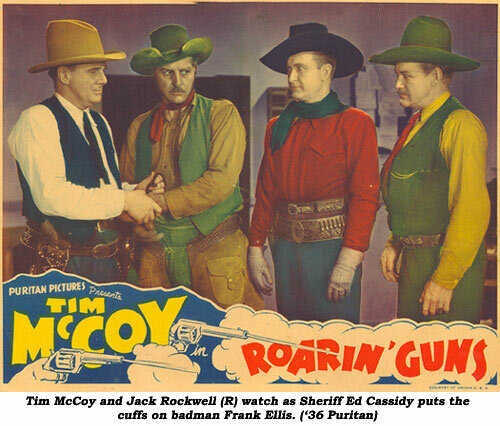 Frank, and other cowboys of the era, could actually work in several productions at a time or quickly move from one to another within a week’s time, because their acting assignments did not limit them to a long period of time as it did the principal actors. 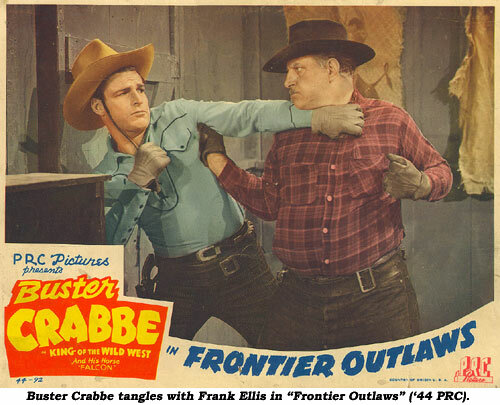 30 serials), the burly frame, prominent roman nose, and stomach paunch of Frank Ellis was a permanent fixture in the B-westerns of nearly every cowboy who ever starred at any studio…although Ellis seemed to find a home of sorts at PRC and Monogram in the mid ‘40s. 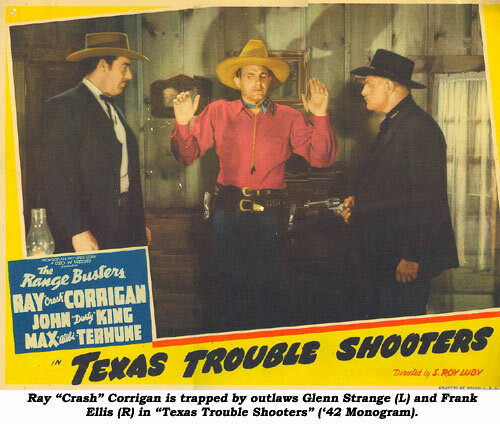 One of his memorable scenes is in “Texas Troubleshooters” where Range Buster “Crash” Corrigan forces Ellis to drink…milk! Frank was widowed at the time of his death, from respiratory failure February 23, 1969, in a Santa Clarita, California, hospital in Saugus where he’d been a patient for over two weeks. He was three days shy of his 72nd birthday. His wife had died February 11, 1964. In his off time, Ellis took pleasure in managing a baseball team that won the San Fernando Valley championship in 1944. Frank’s growley voice and tough demeanor were taken little note of by the “A” film world, but we knew him well—and he’s fondly recalled wherever B-westerns are screened.